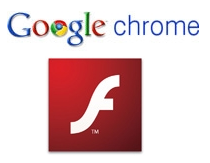 Last March, Adobe and Google jointly announced that Flash Player would soon come built in to the latter’s Chrome browser, eliminating the need for users to download, install and update it separately. On Thursday evening, Google released Chrome 5.0.375.86 to the Stable channel on Linux, Mac, and Windows, with a fix for a number of security issues. More importantly, the integrated Flash Player has now been enabled by default. As Stephen Shankland over at CNET points out, built-in Flash was previously only available in the developer and beta releases of the speedy WebKit-based browser, and the release to the Stable channel means the integrated plug-in is now available in its mainstream version. The update comes a mere two days after Google re-enabled the integrated Flash Player plug-in by default in the Beta channel after disabling it for some time. Not only is Google giving Adobe’s Flash technology another vote of confidence (Flash Player 10.1 for Mobile, which was announced earlier this week, will be rolled out on Android 2.2 phones first), but the integration also means any updates to Flash Player will be delivered directly via Google Chrome’s updating system, ultimately minimizing security risks that tend to surface when one uses outdated software and components.